Global Volunteers are exhorted to “expect the unexpected”. 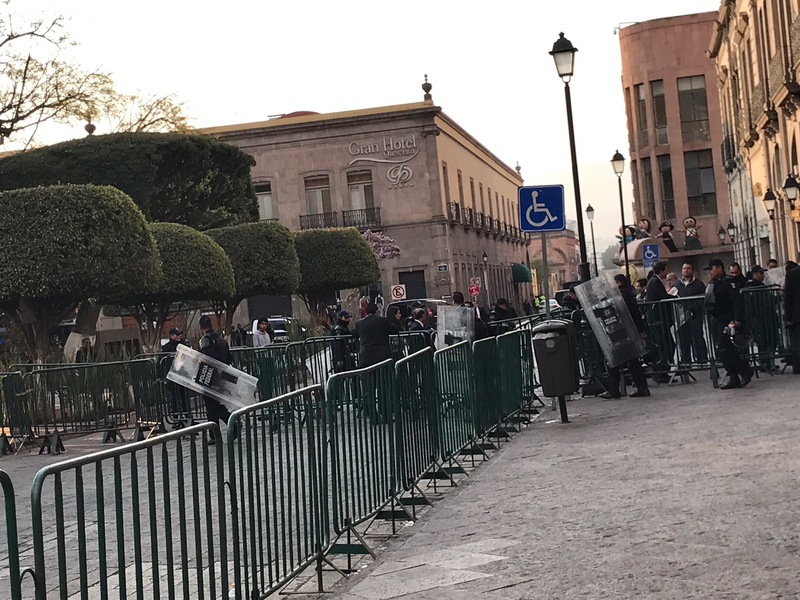 That was good advice indeed, because we certainly didn’t expect to see the federales and military in riot gear a block away from our hotel when we arrived! We learned the streets were blocked in anticipation of their president’s visit the following day. February 5th commemorates the day the Mexican constitution was signed and is a national holiday. This year was the 100th anniversary of that momentous occasion, and since it was signed in Queretaro, what better place for the president to visit? Although initially the sight of all the guns was disconcerting, we had nothing to worry about. Everyone was peaceful and friendly. My “broken” Spanish was sufficient to get us across the barriers to the ATM in the restricted area, not once, not twice, but three times. (I escorted several of my fellow volunteers — and after the second time, I didn’t need to explain. They saw me coming and smiled as they opened the gate.). It was just a minor challenge to our getting settled and was easily overcome. Remember in the last post I said that the Hidalgo is an older hotel? And that you can buy just about anything in Queretaro? Well, both are true statements. The “authenticity” of the hotel means that some purchases might make your stay more comfortable. Fortunately there ARE stores nearby. 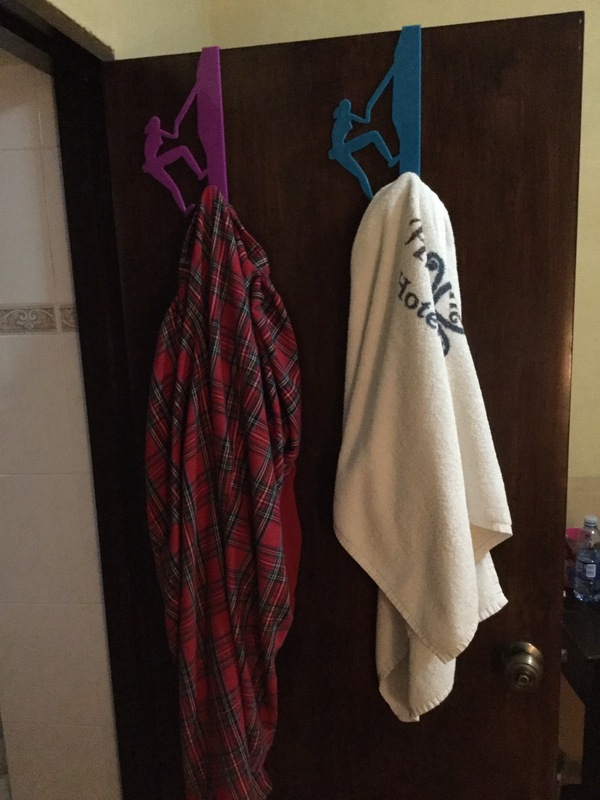 We all decided jumbo towels were a great solution for unheated bathrooms. And you can never have too many hangers. Some objects were a little more challenging to find. The one hook in Sally’s bathroom is strategically placed, right over the toilet. What could possibly go wrong with THAT? It only took ONE day to convince Sally that she needed another option for her towel. So, we embarked on a ‘find the hook that can be placed over the top of the door’ quest. Sounds simple enough, right? It wasn’t. Our search for a “gancho de ropa sobre la puerta” took FOUR determined women TWO whole days! We hit Woolworth’s, del Sol, several sewing shops, the open air market. We even resorted to showing random passers-by a picture of what we wanted, downloaded from the Internet. Leave it to first time volunteer, Kristy. She not only convinced us to check out Waldo Mart, but she was also able to locate exactly what we needed amid the hodgepodge of goods. And yes, you did read that right. Much to our amusement, we discovered the Mexican version of a dollar store, really is called Waldo Mart. The Hidalgo is in an ideal location, in the historic district with restaurants, museums, beautiful gardens and squares close by. It has lots of charm, but what it DOESN’T have are rooms with lots of light. This time, Woolworth’s came to the rescue. For about $10, Sally and I were able to buy small lamps. (Light bulbs, we discovered, are sold in the pharmacy down the street ). It might not look like much, but that little lamp makes a huge difference! I just set it atop my closet and it illuminated my desk (and dressing) area perfectly. The Mexican workers have been very helpful, friendly and oh so patient with my Spanish. I speak like a toddler, but like a toddler, I keep trying, without embarrassment. I THINK i said to the cashier “I only know some words. But I try to learn. Please speak slowly.” But then again, I might have said something else, because after my little speech she didn’t say anything. She just reached over, hugged me and kissed my cheek. 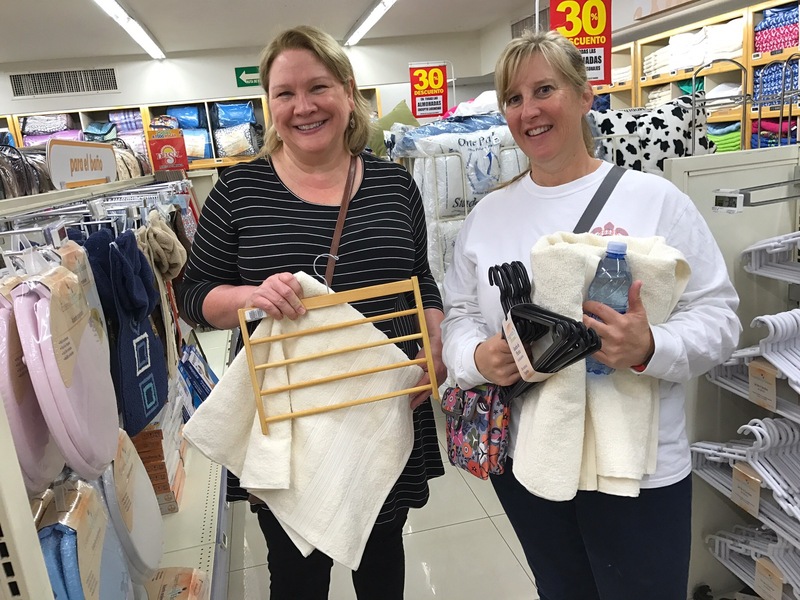 Our shopping was not limited to dry goods. Because the University offers classes from 7 AM till 9 PM, our schedule varies. Some days we make our breakfasts and bag lunches at the hotel, and go out for dinner. When the classes are in the evening, we eat those two meals out, and pack our dinner. I volunteered to be the fruit purchaser, recruiting my three amigos to be my helpers. Because WordPress is being a bit balky, I need to end this post and what better way than with some shots from the market? Thanks for a wonderful time in Queretaro! Our little scavenger hunts added to the fun and led us to new places. What will we do without you? I’m so glad I was able to “show off” my little cousin to my friends. You were awesome, Kristy. I’m so proud of you! I’m afraid that if I was the “spokesperson” for a group in Mexico, I could get us all in real trouble with my limited Spanish. Whatever you actually said to the cashier was obviously friendly and must have made a certain amount of sense. It sounds like you are having fun while doing good works. The locals are so gracious and friendly. I was concerned that Trump’s comments would have changed attitudes toward us, but so far, we’ve had only positive interactions. I had a conversation with a woman from Belgium last night. She said that the Europeans she knows are fully aware of how unpopular Trump is here. They actually feel sorry for us. I would imagine that most Mexicans are also aware of the many, many protests we’ve held and are willing to give us the benefit of the doubt. I am happy when I get in on one of your adventures at the beginning, as I did by reading the previous post and this one. I can’t believe how efficiently you plan and pack and get on your way. I also liked learning how you go about making your room more comfortable for your visit by shopping locally. I think the clerk hugged and kissed you because you were sincerely trying to learn her language and use it to communicate with her. I think you are a good ambassador for the U.S. and I’m looking forward to following your visit. Janet, your comments always make me feel so good. I sometimes wonder whether what I am posting is helpful or interesting to others. Thank you for your kind, reassuring words.